Hello everyone!! I'm so excited for this post and I hope you guys like it almost as much as I liked preparing it. Those were sweet sweet hours of preparation, trust me. Before starting let me just quickly talk about THIS picture that inspired me. 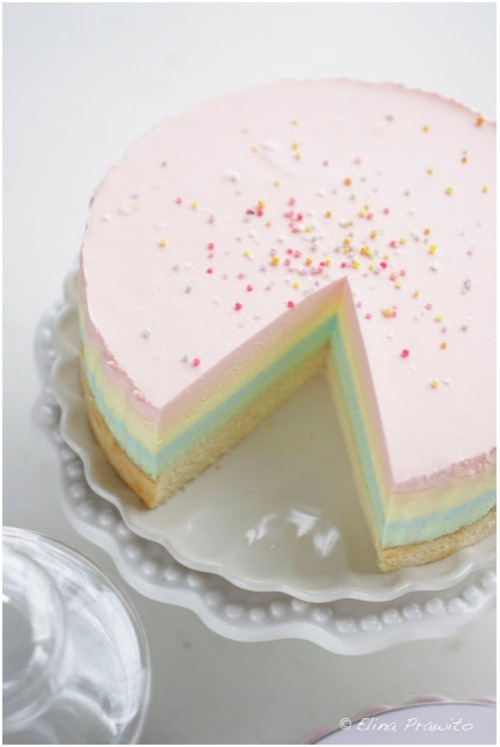 It's a Rainbow Cake. How did I find it? I didn't, it found me through that wonderful and evil thing called Tumblr. Then again we all know that sometimes pictures look too good to be true, les-b-honest THIS is plain witchcraft with a hint of photoshop. Take a round cake pan, those with the removable sides, and place some baking paper on the bottom. Melt the butter I did it in the microwave because 'yolo' and crumble all the cookies until you get a powder. Combine the two in a bowl and pour the mixture in the cake pan. 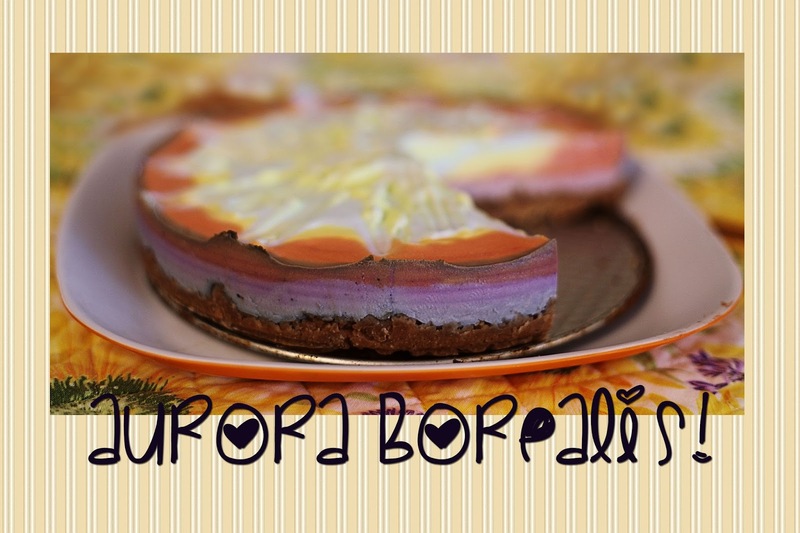 Level with a spoon and put it in the fridge while you prepare the rest of the cake. 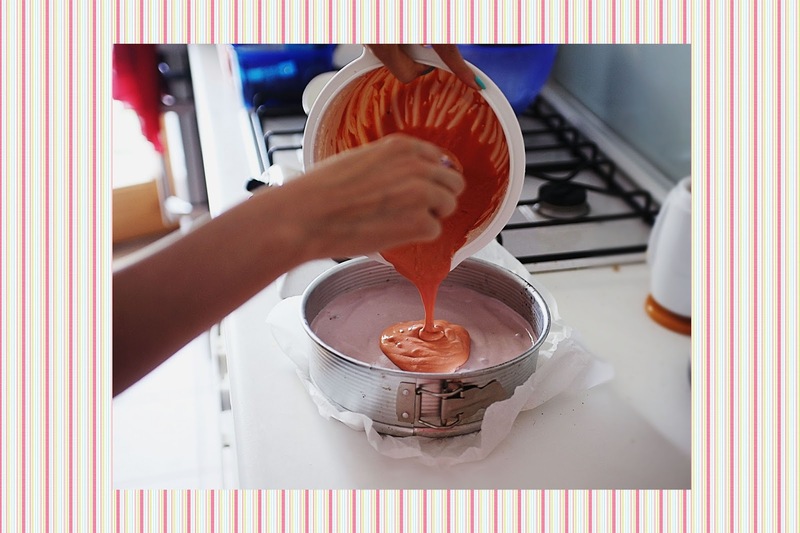 Put the jelly sheets in a pan and pour some cold water on it so that it is almost all covered. Leave it aside for now. 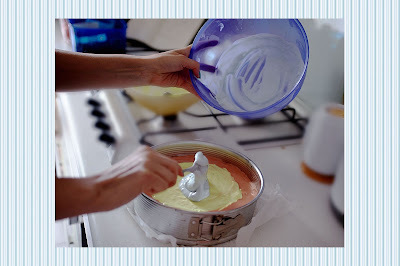 Pour the cream in a big bowl with the icing sugar and whip it slightly. Mine simply refused to rise but it wasn't an issue at all, it is mostly to melt the sugar because the final texture doesnt have to be 'whippedcream-y', it's more like a cheesecake. Without cheese. Here is where I got stuck with my extraordinary planning skills. I thought I'd buy different flavoured yogurts so that also the colour would be different and I could already have an approximate idea of the rainbow colours there. 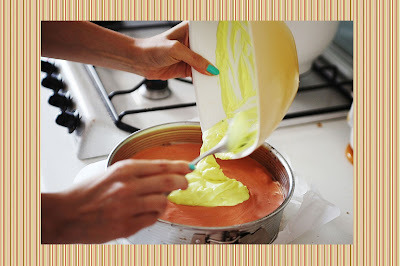 What I did: I took 5 bowls and divided the cream in them making sure to have a different amount in each of them because the base colour would need to be more than the final concentric topping colour. Once i had my bowls i thought of the colour order I wanted my cake to be and poured the right yogurt in each bowl. Blueberry for the purple, strawberry for the orange, white for the yellow and the blue, kiwi for the green... Then I added the food colouring according to my colour needs. Well let me tell you this: food colours are not pastels. Purple does not come out from pink and blue, the yellow should not be legal and the orange is simply not orange. Blue was blue though. 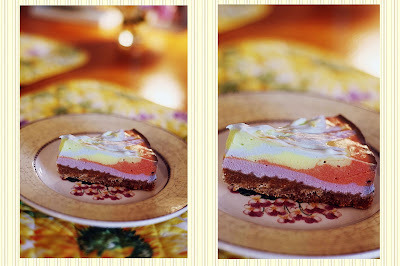 So, if you are trying to make this recipe either stick with white yogurt and use food colouring at your own risk OR just buy all different flavours of yogurt and use their actual colour for the pastel rainbow. Anyway, for the sake of this recipe let's say you only have white yogurt, add it to the cream. All of it if you want a solid colour cake, or divide it into bowls with colouring if you want to taste the rainbow. At this point put the pan with the jelly sheets on the fire on low heat, add water if necessary so that it doesn't stick. Don't let it boil, just stir a little bit until the jelly is melted. Now you can add it to the cream+yogurt mixture. 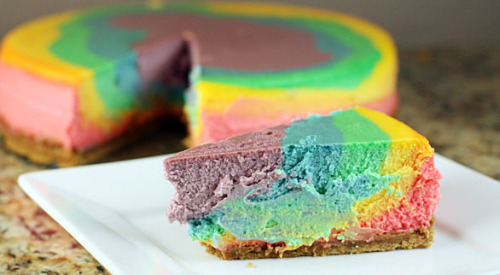 If your cake is just one colour then add all of it to the main bowl, if you, like me, have 500 bowls of rainbow, then add the jelly according to the quantity. Stir well to incorporate that jelly. Oh and don't worry about your hands going Picasso. 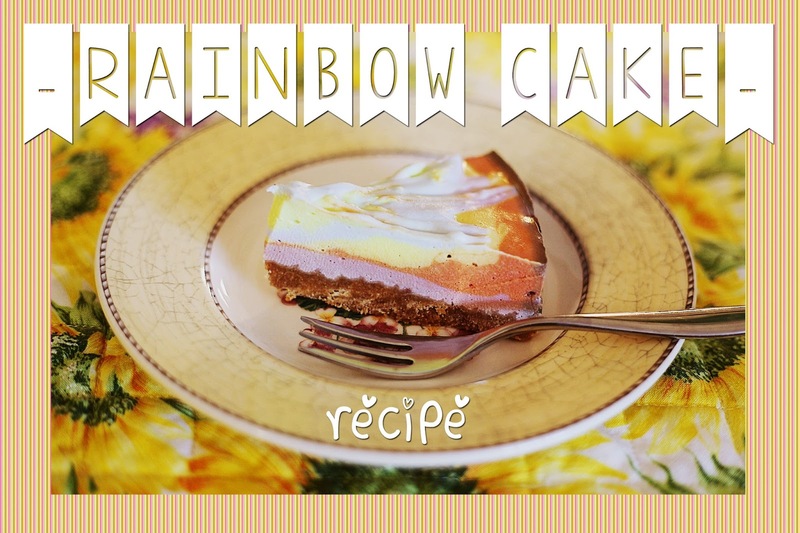 Finally you can take your bowls and actually create your rainbow cake! As I said, I went for a concentric pattern. But since I wasn't satisfied with the final look I used a fork to create some very '60s diy tie dye style. Leave it in the fridge for 4 to 6 hours. 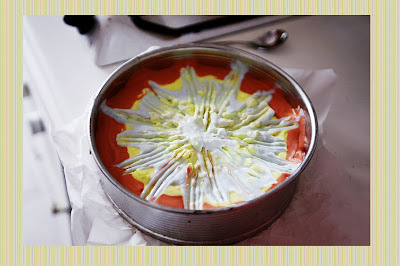 Once completely cool and solid remove the outer metal band and the baking paper and share with your friends! Obviously you also have to take pics. With your phone, camera, supercool camera, webcam... anything. And even if it's blurry or the colours aren't showing up, or if it doesn't even look like the original inspiration, you made it from scratch and it tastes so much better than the ready made cake mixtures. Just look at the colours on the outside meeting the base. Doesn't it look like some sort of exotic sky? An Aurora Borealis maybe? Could that be the Grand Canyon? 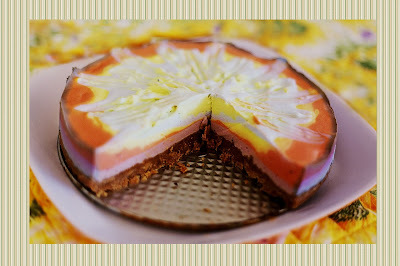 The final effect is amazing, in the end it's a very simple cake, but it looks so fancy ;) And there's some yogurt in it, so it's also sort of a healthy recipe!! A special thank you to Riccardo for the recipe, to Martina for the help and the pics, and to Jacopo for the company and the 3 slices.